This is a very impressive list. I see that you have listed The First book Isaac Asimov's Foundation Trilogy. O suspect that when you have finished it, you may one to move ahead and read the first three books consecutively. Thank you, Brian. My husband said the same thing about the Foundation Trilogy. Hopefully I will like it enough to want to continue! Yay, you decided to go ahead! Looking forward to see the reviews of the books you've read. I've read 12 of the books on your list, and I really, really loved Silence by Shusaku Endo! Have you seen the movie of it? It's a pretty faithful adaption of the book. Eustacia - Yes, after a lot of back and forth I decided to take the leap and do it. :-) Thank you for all your help as I tried to make up my mind. I believe you are the reason Silence was on my Christmas list this past holiday and why I want to read it now. :-) Thank you! I haven't yet seen the movie, but I would like to. I think this is a worthy goal and also think that you've got some winners on this list. I read MATILDA to my daughter years ago. The Christie books are, of course, wonderful. And REBECCA - read it and then watch the Hitchcock movie. And SENSE AND SENSIBILITY. Enjoy!! Thank you, Kay. I am feeling optimistic that I can do it. I could swear I read Matilda at some point many years ago, but honestly am not 100% sure. I've enjoyed Christie's books and am looking forward to revisiting her work. This will be my first time for Rebecca and Sense and Sensibility. I am eager to read both. Lark - Thank you! I wanted to recognize some of my favorite genres, and am eager to read all the books on my list. I just recently read The Little White Horse for the first time. I really enjoyed it. I've been an avid reader for well over 40 years and can't believe I'd never heard of this book. Thanks for sharing your list. It's giving me ideas of books I'd either like to read again, or ones I've never read before! Linda - It was the movie based on The Little White Horse that made me want to read the book--I hadn't even known it existed until this fall! I am eager to read it. This is an impressive challenge or lifestyle :) I am not a classics reader. I have tried and just have a hard time enjoying most classic literature. I do hope that you enjoy all of these! Carole - Thank you! 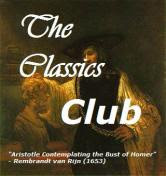 I do not read a lot of classics, but I have enjoyed many of the ones I have read. It really depends on the book, I think. You can do it! I have been tempted to join in but given that I've been trying to complete a classics reading challenge for the past couple of years and can't make it past one book, I don't know. I really want to read more classics though. I hope you have a wonderful time with your project! Iliana - Thank you! I sure hope so. I'll make a good effort of it at least. :-) I'm in the mood for them right now, so we'll see if the fire I'm sitting on lasts.